as a new honorary member. Now, what was that about "apply a suitably PPE'd toe to a few backsides"? The non availability of officials due to their leisure commitments has been a prominent feature of our interactions with the EA over the years. Looks like The EA will be playing "Hide Henry" rather than "Where's Wally" - being as they've got an over abundance of people in red and white bobble hats. They also have independent specialists taking the PISS paid a fortune to come up with corrupt reports. We will be putting up the reports and authors shortly, then ripping them apart for all to see with the evidence of coarse, when you see these bear in mind how much they cost tens of thousands. You tube will be uploaded also? great video no smiles. Videos of what and when will you put them up. Well done HENRY? openness and transparency just what the GOVERNMENT want. Not what the ENVIRONMENT AGENCY WANT. Keep whistle blowing. I'm happy answering any questions you have. I have a lot to post on the website I have started. You would be amazed at the large scale waste that takes place. I was amazed when I joined to find how bad it was, because for an organisation like ours to profess protecting the environment, health and property, we are far more interested in protecting our gravy train. It's all about positive PR now, with massive funding going into PR programmes such as the new high profile uniforms, which has had it's own problems. Few, if any, employees want to whistle blow, because it is such a cushy job with high salaries, flexible working (which is abused) and generous pension, where our staff and managers are on inflated salaries (well above national average for work requiring little effort) who choose when to work and what they do. No private organisation could ever afford to allow the working practices allowed in our organisation. My aim is to expose these practices and get public oversight where it's frankly been lacking. To pick up on your point about public oversight - we have experienced obstructiveness, dissembling and bullying on a truly epic scale, our MP was put into mushroom cultivation mode, Richard Benyon the Minister in charge is incurious and obligingly parrots EA briefs. We have observed in FoI documents in our possession a culture where some people identify very serious (showstopping) problems - but any action to deal with said problem is left with the perpetrators... - those perpetrators it has to be said then go on to cover up, recruit naive scapegoats, hide evidence and indulge in procedural delaying tactics in the hope that their victims will run out of money or the will to live and some obviously "get their rocks off" tormenting victims. All - it has to be said - lavishly funded from the public purse. I wonder how independent these specialists are please NAME them and we can checkout the links to the EA and how much money they are been PAID BY THE TAX PAYER what is going on when the NHS and are troops are been cut??? The uniforms have been designed and provided so that the EA is more visible in public. Management have confirmed that it's a large PR effort to increase visibility. What you need to understand about my organisation is that all decisions are made based on how much positive PR we can get, because it's all about protecting our funding. I have witnessed daily how we overlook and ignore serious environmental, health and property dangers that are in the back wood, so to speak, but will focus our entire efforts on smaller incidents with greater 'spin' potential. You probably won't be surprised that we were all told to 'throw' away our old uniforms when we received the new one - very environmentally friendly and cost effective. I haven't even begun to open up about the tricks we use to increase our number of case files we deal have, how the personal opinions of officers influence their decisions and so much more. If police officers acted the way our officers did, there would be a huge public inquiry. Hi Tom. I'd be happy to discuss this by email. 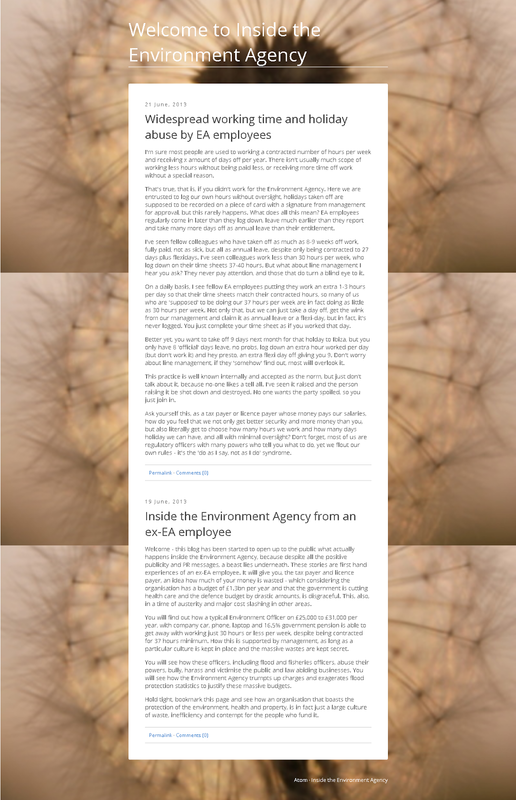 As a Senior Manager, I can say I am fed up with this constant denigration of the Environment Agency. Who has appointed you are the judge of the Agency? You know nothing of the work the Agency does in ensuring the environment of this country is maintained to the highest standards. I do not believe that Hydropower benefits the environment. The best option for the environment and the ecology of our rivers is to remove all barriers and return them to their natural state. This hate campaign started by you over a correct decision is groundless. This tripe written by a disgruntled employee is also groundless. The Agency is well managed and with conscientious and dedicated professional staff. Thankfully you are not among them. The route of the problem leads directly to management. Failure to identify issues, leads to more issues. Failure to recognise when things have gone wrong leads to more errors. Protecting your mistakes rather than rectifying them creates angry, discontented people. The public perception of the EA is not good- the rivers have been poorly managed - its on the news as I type!! Although I agree there are some conscientious and dedicated staff, my experience was that of a staff on a race to do the minimum. I'd be interested to know what part of the organisation you're a senior manager in. You have a duty to identify yourself when talking on behalf of the EA. Clearly deluded has this senior manager missed something this website has a great amount of evidence,YOU SCREWED UP. In the process their are many individuals who have wasted a horrific amount of money.They should be named and shamed,Disgruntled employee maybe or does truth hurt? At Long Last - a response ... possibly? That's positive - we agree on something - we're fed up too - and we're actually doing the denigrating. Members of the public - peons - put upon ones at that. Nobody - but actual judges seem to take a dim view of what the EA have been up to. We really do have better things to do than to do unpaid work looking into the activities of EA officials - but since we have been forced to look closely at how the EA goes about its business - across several "business areas" - *not* just hydro power - we have found significant shortfalls in technical competence, basic honesty, consistency and adherence to codes of conduct and statutory duty - that last one landed the EA at Judicial Review over Avoncliff - where they were found to have acted unlawfully and if they hadn't withheld pivotal information it would have beeb far worse for them. Fair enough - although you might find a few people in East Anglia, behind the Thames Barrier or living on the Somerset Levels who'd dispute that - If you'd like to do a guest post here on the subject we are happy to publish it unedited. That remains to be seen - and I doubt you've the evidence to support that assertion. The Agency is well managed and with conscientious and dedicated professional staff. Crikey, another thing we partially agree on ... We are aware that the EA has some very dedicated and conscientious staff and capable managers - sadly though, it's not all (or enough) of them. Thankfully you are not among them. Nice one looks like the possible Senior Manager just took a big one where the sun does not shine. We have only knowledge of ONE HONEST SENIOR MANAGER out of EIGHT we have experienced and that is ANDY BAXENDALE? He would have done it right in our opinion but, DAVID JORDAN needed a fixer----JOHN SWEENY--- we asked for him to be removed twice he was clearly on his own agenda. ENVIRONMENT AGENCY NO MATTER HOW MUCH YOU COLLUDE THE TRUTH WILL CATCH UP WITH YOU. The main problem that you guys will face, especially those close to you, is that the EA have been putting in place an intelligence system whose sole purpose is to gather substantiated and "unsubstantiated" information, as well as rumours and opinions. We use it to input any and all details on anyone remotely linked to environmental actions - email addresses, home address, relations, associates, licence plates of your vehicles, etc. It has been implemented over the past few years and is still in its infancy, so there is a huge push for officers to gather as much information as possible to put on the system, as it relies on making links between data. The major problem with the system is that there is no oversight and it is being opened up to more officers. I have major concerns with some colleagues and the abuse they could cause with the information. Much of the information is very sensitive and is typically gathered by the Environmental Crime Team who carry out covert surveillance. Unfortunately, I don't know how or if the information gathered effects permit applications, but obviously, there are major concerns. I think of particular concern to Avon Cliff would be the National Incident Response System (NIRS) and Case Management Systems (CMS) - officers who take a disliking to individuals, groups and companies will call in anonymously to report "pollution incidents" or "waste crimes" knowing that this will be logged and made use of in public data which can influence sales prices, etc. This is something you might want to FoI, as it occurs regularly. But then I don't blame him everyone has to live and you don't stand much chance with a (non-)government body against you. As much as I would like to share my internal experiences and expose the large scale waste, questionable procedures and the bullying of operators, I've been threatened with court action. I'm unclear on my rights, so I'm stuck on where to take this. The actions I have witnessed would result in judicial review if a police officer had done the same things. Hi Henry - nice to see you're not off the radar totally. We have been threatened with court action too 'pon occasion - the bullying tactics deployed by the EA are familiar to us. We would be interested to hear if it's defamation or some kind of employee gagging. There is a very, very clear route through gagging - no question of that. As to defamation - HM Treasury Solicitor? or one of the conniving shitweasels on the EA's legal team? You can post the answer as a comment - it won't get published - there are a number of political and legal individuals who will find the answer of interest. Inside the EA is back up and running. CHECK IT OUT. I understand your position. The EA will bully and threaten and will even go as far as starting a spirious case which will eventually be shown as having no merits but the cost to you to defend yourself will be prohibitive so you will either go broke or give up so they win.Even though they know the case is spurious they will be quite willing to waste public money. I've been warned that if I continue, then they will take legal action for defamation. The problem I have is that I'm posting what I have experienced internally, so unless my fellow colleagues speak out or an official proceeds with an internal investigation, it's going to be difficult to prove what I have witnessed. In effect, they have me over a barrel. check out Henrys blog INCONSISTENT REGULATORY APPROACH 9th July www.insidetheenvironmentagency.co.uk I think this describes exactly what they have done to you guys, someone should be locked up for this. All that green power gone over the weir and public money the EA should come clean.